Republicans on both sides are threatening to vote against the bill if their demands aren't met. Adding to the pressure, GOP lawmakers are hearing from many provider and consumer advocacy groups fiercely opposed to the bill in its current form. Insurers also have asked for big changes. Congressional GOP leaders had hoped to pass their bill by early April, before members head back to their districts for the Easter recess. But that now looks highly unlikely. So they may face another round of tense encounters with constituents upset about the prospect of losing their ACA coverage, similar to what happened at town hall meetings around the country last month. The wild card is where President Donald Trump comes down in the intraparty battle. So far he's sent mixed signals, despite his numerous promises that his plan would provide coverage for everybody and that it would be cheaper and better. He initially came out in support of the House bill, then said it was open for negotiation. Recently he suggested Republicans should wait until Obamacare falls apart and then blame Democrats for the fiasco. Some conservatives are pressing Trump to abandon the House bill entirely because it could hurt his older, working-class supporters. The bill faces its next test Thursday, when it will be considered by the House Budget Committee. One conservative committee member, Rep. Dave Brat of Virginia, said he won't vote for it unless it's amended to repeal the ACA's insurance rules such as mandating minimum essential benefits. Just three more no votes from committee Republicans would kill the bill. House Speaker Paul Ryan, who originally pushed to pass the bill speedily with no changes, now is talking with conservatives about possible revisions to get it through the House. Then Senate Republicans could make changes and pass their own bill, after which the legislation would go to a conference committee. But it's not at all clear that the House and Senate can work through their differences, which likely involve sharply different levels of federal spending. They can afford almost no defections, because few if any Democrats are expected to vote for the GOP bill. GOP anxieties spiked following Monday's release of a Congressional Budget Office report projecting that the AHCA would lead to 24 million more uninsured Americans by 2026, with a disproportionately negative impact on lower-income and older people. The bill would drive up individual-market insurance premiums by an estimated 15% to 20% in 2018 and 2019, though premiums would drop in later years. On the other hand, it would cut the federal deficit by $337 billion over 10 years, largely by reducing Medicaid spending and the number of beneficiaries covered. Check out our list of 13 top findings in the CBO report. Meanwhile, public support for the ACA has risen, while support for the House repeal-and-replace bill is shaky. A new Kaiser Family Foundation survey found 49% of respondents have a favorable view of the ACA and 44% have an unfavorable view. Fifty one percent said Congress should not repeal the law, while 45% said it should. About half (48%) think the GOP plan would reduce the number of insured people, while 18% think it would increase those with insurance and three in 10 say the insured total will stay about the same. Sen. John Thune (R-S.D.) and other Senate Republicans told the White House they wanted the bill changed to boost premium tax credits for poorer, older Americans, who would face huge out-of-pocket cost increases under the current legislation. They want the tax credits to be based on income and geographic location as well as age. Insurance premiums often are higher in rural areas. AARP, the older Americans' advocacy group, has dubbed the bill's projected sharply higher premiums for people aged 50-64 an “age tax,” which could be politically explosive among older voters. Meanwhile, GOP senators and governors are pressing for elimination or changes in the bill's phase-out of enhanced federal funding for the ACA's Medicaid expansion to low-income adults. They also seek revisions in the bill's caps on total federal Medicaid payments to the states, which the CBO said could lead to cuts in eligibility, covered services, and provider payment rates. The hospital industry is lobbying hard against the GOP's capped Medicaid funding model. Such changes in the tax credit and Medicaid provisions could sharply increase the bill's price tag, reducing or erasing its promised deficit reduction and potentially endangering its ability to meet the Senate's strict budget reconciliation rules. House conservatives, however, are pushing the other way. They want the ACA's enhanced federal funding for Medicaid expansion eliminated at the end of this year, two years earlier than in the bill. That reportedly has the support of the Trump administration. Another change proposed by House conservatives is removing the bill's 30%, one-year premium penalty for people who buy insurance after a coverage gap. Supporters of the penalty say it's necessary to replace the ACA's individual mandate penalty, which the House bill would repeal, as a mechanism to keep healthier people in the individual insurance market. But the CBO said it would lead to fewer people buying coverage, and that those who did buy in would be sicker. While the legislative battle rages, it soon could be overshadowed by a crisis in the individual insurance market. That could emerge when insurers announce in April and May whether they will offer plans for 2018, and what their premiums will be. 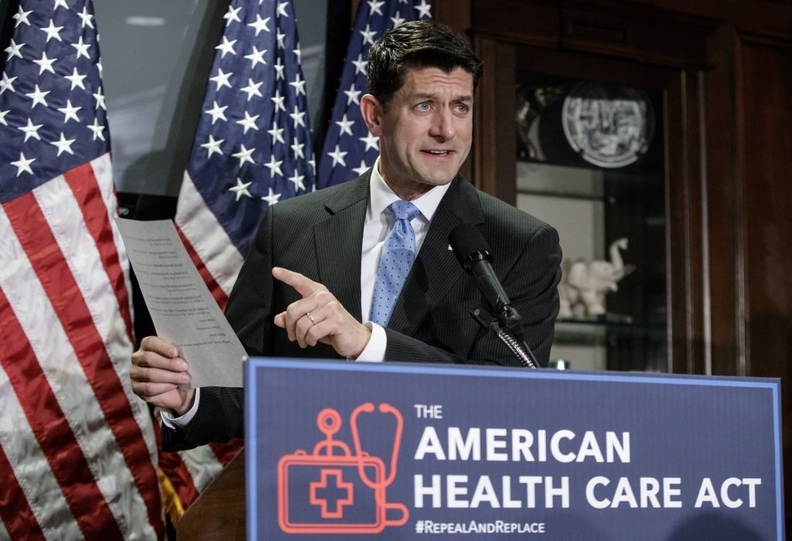 Insurers have warned that they may withdraw from the markets unless Congress funds payments to them for the ACA's required cost-sharing reductions for lower-income enrollees – which House Republicans have sued to block. And they are pushing for restoration of risk payments to plans that sign up sicker members, which Republicans also rolled back. Some carriers say the huge uncertainty created by the GOP repeal-and-replace effort means they'll have to sharply raise premiums next year. Their jitters have not been calmed by the administration's moves to relax enforcement of the individual mandate and its lack of support for signing up more people during the recent open enrollment period. A recent letter from Anthem CEO Joseph Swedish warned House GOP leaders that it would start to exit the 14 markets where it sells exchange coverage unless there are significant legislative and regulatory changes. He particularly cited the need for funding the cost-sharing subsidies, which are expected to total $9 billion in 2017. Despite their travails, many observers expect Republicans to do whatever it takes to get their healthcare bill over the finish line -- no matter how painful the ideological compromises.